Bed and Breakfasts near Wightlink Raiders Planet Ice Ryde Arena for 1 night from Thu Apr 25, 2019 to Fri Apr 26, 2019 within 25 miles, in an Average Nightly price range of £1 to £200. Situated on Ryde Esplanade, on the Isle of Wight, Royal Esplanade Hotel boats views of the Solent. The Grade II Victorian building, features a terrace and restuarant. Boasting a 24-hour front desk, this property also provides guests with a restaurant. Free WiFi is available. The rooms in the hotel are fitted with a kettle. Royal Esplanade Hotel features certain rooms that include sea views, and every room comes with a private bathroom with a bath or shower. All guest rooms have a desk. A full English breakfast is served daily at the property. Enjoy evening meals at the restaurant or bar which offers home cooked meals made from locally sourced ingredients. Shanklin is 12 km from the accommodation. Ryde Hoverport is opposite the hotel. Welcome to Kasbah... br / br / br / br / The Kasbah is a Moroccan themed Cafe Bar with seven beautiful individually decorated guest bedrooms. All are en-suite with either a shower/bath or both. Our family room can accommodate up to four adults. Our best room on the second floor of the listed building has sea views over to Portsmouth and the Spinnaker Tower. All rooms are supplied with a Tassimo machine with various pods available complimentary bottled water and toiletries. Each room is equipped with a colour television and Wi-Fi available throughout. br / br / br / br / The Kasbah is perfectly situated in the heart of Ryde just seconds away from the beach and mainland and island transport links as well as local tourist attractions and entertainment facilities. Making us the perfect place to stay whether you are coming on business walking or sightseeing holidays or to enjoy the islands nightlife or year round live music food and sporting festivals. br / br / br / br / Groups stag and hen parties welcome and discounts are available for long stays single occupancy and large bookings. Private hire also available. br / br / br / br / Please Note: Kasbah is also a popular and vibrant cafe-bar come cocktail bar in the evening. If you are booking one of our first floor rooms during a weekend you may experience some degree of noise up until 2am from Kasbah and the highstreet outside. Centrally located 23 bedroom Bed & Breakfast establishment with ample FREE off street car parking at the rear of the Bed & Breakfast. All our rates include breakfast offering a choice of cereals and fruits and a selection of hot dishes white or wholemeal toast and as much tea coffee or fruit juice as required. Licensed bar free Wi-Fi in the public areas patio and garden available. We welcome holidays and business visitors and we are within walking distance of the hovercraft and catamaran sailings from Southsea and Portsmouth. Visit Britain 3 star guest accommodation rated. We can offer discounted rates for all car ferry crossings to the Island. Open all year except Christmas and New Year. On the Isle of Wight, the Abingdon Guest Lodge is close to the main shopping area of Ryde and within a 10-minute walk of the beach. It offers en suite rooms, free Wi-Fi and free parking. Rooms at the Abingdon all have Freeview TVs, DVD players and table-top fridges. They also include tea/coffee making facilities and hairdryers and irons are available at reception. The Abingdon Guest House is a 5-minute walk from Ryde town centre and Ryde St Johns Road Rail Station. The bus station is also nearby and has excellent transport links to the rest of the island. Abingdon Guest Lodge is located at the top of Ryde just 5 minutes away from the esplanade beautiful beach and town centre which offers many pubs cafes and restaurants. Our bright comfortable and well presented accommodation is ideal for business travellers those on short breaks and for people looking to be centrally located while enjoying the delights of the Isle of Wight. Your resident host at Abingdon Guest Lodge is Dennis Armstrong. Dennis has considerable experience in the hospitality industry and will personally ensure that your stay and the standard of your accommodation will reach your expectations. Abingdon Guest Lodge is able to offer guests FREE car parking and is positioned on a main bus route which runs regular services between Ryde and the County town of Newport from which you can easily reach other outlying areas and attractions. All rooms are tastefully decorated with modern furnishings and en-suite facilities. We also ensure that your hospitality tray is topped up with teas and coffee. Abingdon Lodge is room only accommodation. However a full continental breakfast is available on request at an additional �5.00 per person per night. Abingdon Guest Lodge is open all year round and has centrally heated accommodation. We can offer various configurations such as single double and twin rooms as well as our newly renovated suite which can comfortably accommodate six persons with adjoining door making it possible to accommodate 12 persons. Welcome to The Fishbourne quality dining and accommodation by the sea. Check-in commences at 3.00pm daily last check-in 9.00pm. br / br / br / br / The Fishbourne is located in a picturesque and wooded enclave between the main towns of Ryde and Newport on the Isle of Wight. Situated close to the Wightlink Fishbourne to Portsmouth ferry terminal this makes us the ideal entry point to the Island to experience our quality dining. br / br / br / br / We have an extensive wine selection and superb real ales. br / br / br / br / We use local produce whilst creating meals for the restaurant. With local fresh fish dishes a daily specials board vegetarian options a smaller appetites menu and traditional pub favourites there are many options available to suit all tastes with a selection of mouth watering desserts on offer. br / br / br / br / With five beautifully appointed en-suite rooms available including two twins two double suite/family rooms and one small double room providing modern stylish accommodation with a homely feel and a nautical theme. br / br / br / br / Each of our rooms have flatscreen televisions with Freeview and a DVD player alarm clocks with I-Pod docks a hairdryer and a complementary tea and coffee tray. Overlooking a 20-acre lake, and in 17 acres of grounds, this 4-star hotel has an indulgent spa and free Wi-Fi throughout the building. Lakeside Park Hotel offers dining options with picturesque views. All of the rooms feature air conditioning, an en suite bathroom, and a flat-screen LCD TV with Freeview. Two of the suites have four-poster beds. The hotel's extensive leisure facilities include a swimming pool, a fragranced experience shower, a hot tub, a sauna and a steam room. Four treatment rooms and a relaxation room complete the luxurious experience. Guests can enjoy a meal in the brasserie, which also features a lakeside terrace. A range of cocktails, beers and wines are served. Shanklin is 11 km from the accommodation. Situated in Alverstoke, The Old Lodge Hotel boasts a restaurant and a bar, along with free onsite parking. The rooms include a flat-screen TV and tea and coffee making facilities. The en-suite bath or shower rooms have complimentary toiletries. Free Wi-Fi is available in public areas. In the mornings, The Old Lodge Hotel serves an extensive breakfast menu. Guests can choose from full English breakfast, black pudding with sautÃ© mushrooms, and poached kippers. The restaurant offers a wide range of evening meals and desserts. Alverstoke is just 2 miles from the town of Gosport. Situated in the heart of Bembridge village at the east end of the Isle of Wight. Offering accommodation for families couples singles and well behaved pets are welcome too. We are close to all the village amenities and the beach is just down the road. Mulberry Cottage is set in a private walled garden just off Bembridge High Street with off road parking. Mulberry Cottage is a family run Bed and Breakfast establishment situated in the heart of Bembridge village at the east end of the Isle of Wight. Offering accommodation for families couples singles and well behaved pets are welcome too. br / br / br / br / We are close to all the village amenities and the beach is just down the road. Mulberry Cottage is set in a private walled garden just off Bembridge High Street. br / br / br / br / We can also pick you up and drop you off at the Wightlink ferries in off peak times and are now offering winter discounts on stays for more than one night. br / br / br / br / We aim to make breakfast to suit your individual tastes and use fresh local and organic produce wherever possible. The breakfast room opens onto the patio and pretty garden which you are welcome to breakfast in or just relax in as you enjoy your stay with us. br / br / br / br / Coffee and tea making facilities are provided in all rooms as are a TV and DVD player. We also provide free WiFi throughout the property. br / br / br / br / Bembridge is a lovely place to visit with restaurants cafes pubs Bembridge Harbour and beautiful beaches all within easy walking distance. We are also surrounded by beautiful countryside. 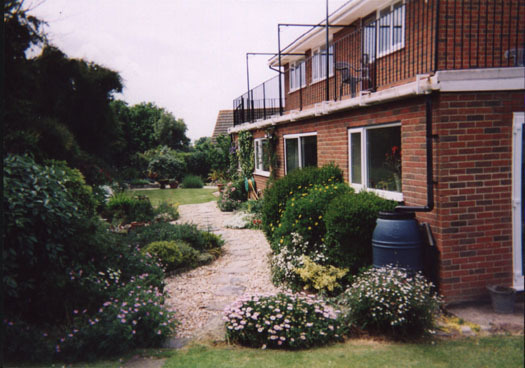 Offering a garden, Mulberry Cottage B&B features accommodation in Bembridge. Complimentary WiFi is provided. A flat-screen TV and DVD player are available in some units. A Full English/Irish breakfast is available every morning at the property. The bed and breakfast offers a sun terrace. Shanklin is 12 km from Mulberry Cottage B&B. Just a short walk away from the beach, Chester Lodge is an excellent location for a holiday, family visits, or to explore one of the many local attractions, such as Gunwharf Quays, or HMS Victory. The Spinnaker offers fabulous locally produced food with fish a speciality it has thirteen beautifully appointed en-suite rooms ideal for a relaxing get away or a business stay in the chic village of Bembridge. Welcome to The Spinnaker quality dining and accommodation. Check-in commences at 2.30pm daily last check-in 9.00pm. Check out time is 10.30am. br / br / br / br / We use local produce whilst creating meals for the restaurant and our Head Chef has experience in fine dining. With local fresh fish dishes a daily specials board vegetarian options a smaller appetites menu and traditional pub favourites there are many options available to suit all tastes with a selection of mouth watering desserts on offer. We also have The Stern Room our fine dining restaurant. br / br / br / br / We have fourteen en-suite rooms available each of our rooms have flat screen televisions with Freeview and a DVD player alarm clocks with I-Pod docks a hairdryer and a complementary tea and coffee tray. br / br / br / br / Bembridge is located on the eastern point of the island 20 minutes away by car from the ferry port of Ryde. You are able to walk to Bembridge beach from The Spinnaker and take in all the views. br / br / br / br / Further along the coast into Ryde there is a swimming pool ten-pin bowling alley as well as an array of shops in the town. br / br / br / br / So however much or little you wish to do on your break with us Bembridge is an ideal base to create your perfect holiday with The Spinnaker being a perfect place to start.